Indoor air quality can be affected by moisture levels within your home, as well as the condition of your HVAC system and the ductwork in forced air systems. At BeutlerSM Air Conditioning and Plumbing, we know that the air quality in your home is a top priority in home comfort, and we want to work with you to help make your home as healthy and comfortable as possible. While being exposed to pollutants and allergens in your home could exacerbate respiratory issues caused by asthma and allergies, some of the sources of these pollutants and dust particles cannot be totally eliminated. However, indoor air quality technologies may drastically limit the exposure to these pollutants and allergens. 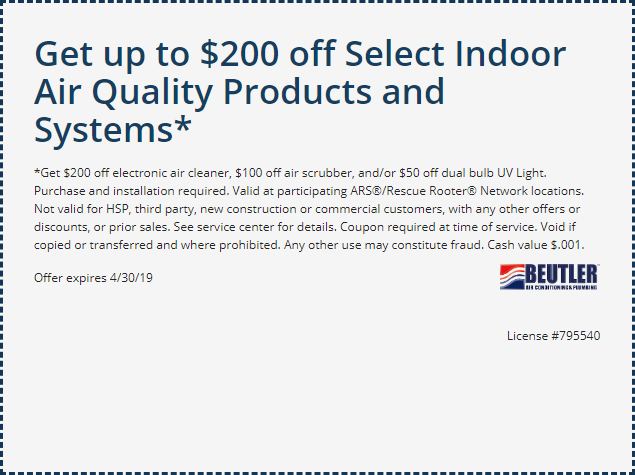 *Get $200 off electronic air cleaner, $100 off air scrubber, and/or $50 off dual bulb UV Light. Purchase and installation required. Valid at participating ARS®/Rescue Rooter® Network locations. Not valid for HSP, third party, new construction or commercial customers, with any other offers or discounts, or prior sales. See service center for details. Coupon required at time of service. Void if copied or transferred and where prohibited. Any other use may constitute fraud. Cash value $.001.